The Dufour 460 is a modern cruising sailboat available for charter on the Adriatic Sea from Dubrovnik, Murter, Pula and Split in Croatia. This boat built in 2018 by Dufour shipyards comes in a generous configuration of four double cabins with inviting beds with a wide and bright living room. 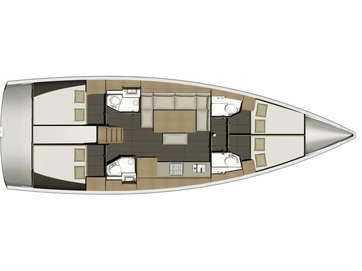 The Dufour 460 can comfortably accommodate and accommodate up to eight passengers on board. Her indoor living spaces offer all the necessary facilities for a tranquil sea sail. Her outdoor spaces facilitate your enjoyment of the Adriatic coastal sea breezes and the clear waters of the Mediterranean. This sailing yacht is available for yacht charter with a base price of 3 330 € (approximatly 3 755 $).